After our early morning adventure to Brighton Beach and an hour’s walk from Southern Cross Train Station, we arrived just at lunch time for our food adventure at Chez Dre. Tucked away in one of South Melbourne’s laneway is home to patisserie and cafe, Chez Dre, offering French-inspired sweets and savoury delights, pastries and a great selection of petits gateaux. 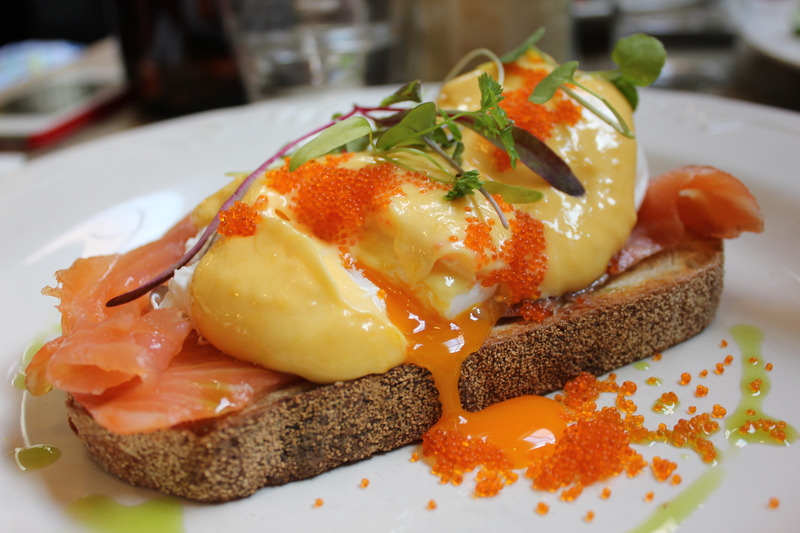 I had the Eggs Royale ($18.50) which consists of smoked salmon, tobiko, yuzu-miso hollandaise and poached eggs on sourdough. The eggs were poached to perfection with orange liquid full of goodness oozing out from the eggs. Apart from the eggs, the smoked salmon was fresh and the tobiko gave a hint of crunch with every bite. 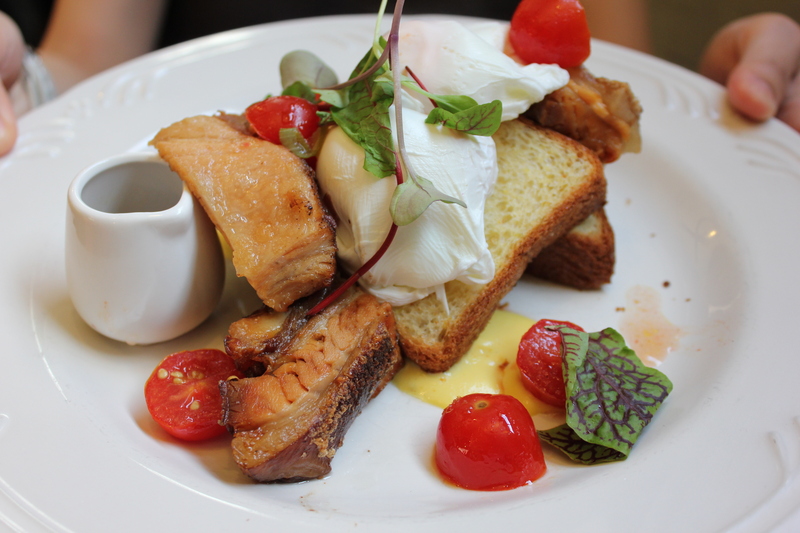 What stood out from the Eggs Royale dish was the yuzu-miso hollandaise. It was rich, creamy and had the perfect consistency complementing well with the other elements of the dish. Ruiqi had the Duck Sandwich ($23.50) which comprises of confit pulled duck, onion jam, red cabbage, grated apple, truffle mayonnaise and panini. According to Ruiqi, it was love at first bite. The Duck Sandwich was generous in portion and the duck meat was soft and tender. 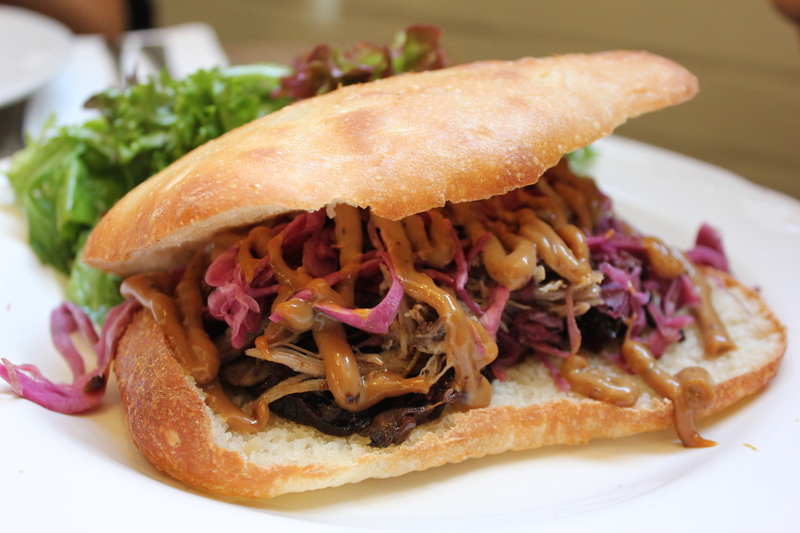 However, the duck meat when eaten alone was a bit salty but together with the the red cabbage and mayonnaise, it balances out the salty flavours of the duck meat, adding a hint of freshness and acidity to the sandwich. Val had the Slow Braised Pork Belly ($23.50) which comes with tomato and jalapeno salsa, creamed corn, pig trotter jus, poached eggs and corn brioche. Val thought that her dish was bursting with flavours from the jalapeno salsa, creamed corn and pig trotter jus. She also enjoyed her pork belly and thought that the meat was tender as it was slow braised but it would be spot on perfect if the skin was a tad crispier. For dessert, I had the honour of choosing a cake to try from a selection of Petit Gateaux. There was just so much variety and selection to choose from that I stood at the counter for a good five minutes – I could not decide what to order as everything looked so good that I would order one of each if I had another stomach! 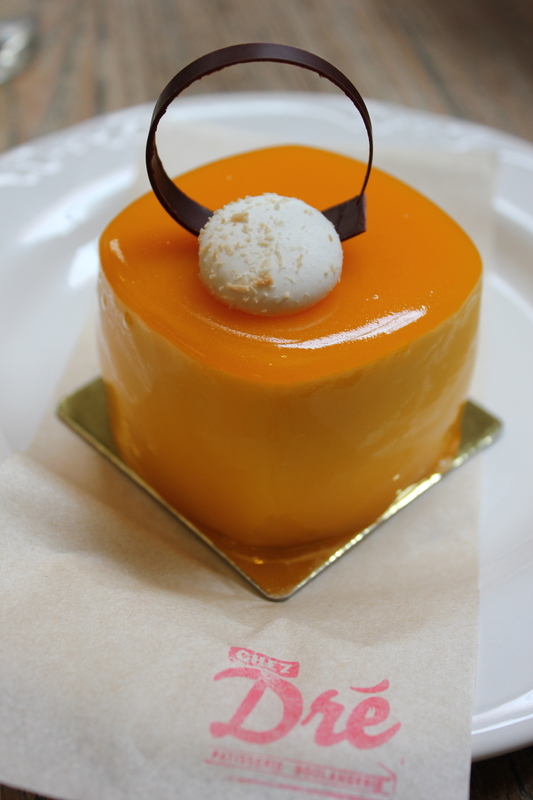 In the end, I chose the Mango, Coconut and Yuzu ($9.50) to share as there was only one left so I assumed that it must be one of the popular cakes. The Mango, Coconut and Yuzu cake is made out of mango jelly, coconut mousse, peanut tuile, white chocolate and yuzu cremeux and roasted coconut dacquoise. It was refreshing and had a right amount of sweetness with a lovely balance of flavours. Overall, my friends and I had a great dining experience at Chez Dre and it was definitely worth the one hour walk. The atmosphere of the cafe was modern, relaxing, airy and comfortable with a lovely courtyard outside for beautiful summer days with blue skies. The service was also excellent – friendly, efficient and welcoming. Now I know why Chez Dre is so popular among locals in Melbourne and it has definitely become one of my favourite brunch places in Melbourne too! I highly recommend Chez Dre for their food. Oh and don’t forget to leave without trying their petits gateaux. As there’s a wide selection to choose from, you will definitely be spoilt for a choice! Mmm love the cakes here!